Professional Master Airbrush Fine Detail Control Airbrushing System with 3 Airbrushes G22, G44, E91, Master Air Compressor TC-20 & Air Hose. Professional Master TC-20 High Performance Airbrush Compressor with air filter / pressure regulator. 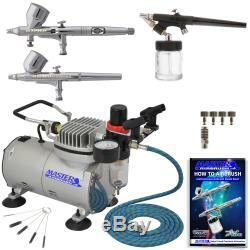 Master Model G44 High Precision Detail Control Gravity Feed Airbrush, Model G22 Master Performance Gravity Feed Airbrush and E91 Siphon Feed Airbrush. The G44 provides extreme atomization & air control! Excellent for applications where accurate spray control is required to do highly detailed work: auto & motorcycle graphics, illustration, nail art, fine art, etc.. Also includes a Free How-To-Airbrush Guide Booklet & a Free Set of Airbrush Cleaning Brushes. Includes Master's How-To-Airbrush Manual. Versatile system is ideal for multiple uses: hobbies, crafts, fine art, nail art, temporary tattoos, cake decorating, sunless tanning, cosmetics, auto-motorcycle graphics & more! Master Airbrush Model G44 Airbrush Set. Master performance multi-purpose high performance dual-action airbrush with a 1/3 oz. Gravity fluid cup, micro air control valve and a 0.2mm needle & nozzle that allows you to spray from hairline up to 1 wide patterns. Master Airbrush Model G22 Airbrush Set. Gravity fluid cup and a 0.3mm needle & nozzle that allows you to spray from hairline up to 1-1/2 wide patterns. Master Airbrush Model E91 Airbrush Set. Single-action external mix siphon feed airbrush set with a 0.8mm tip, 2 - 3/4 oz. Master Airbrush Air Compressor Model TC-20. Professional high performance single-piston airbrush air compressor with air pressure regulator with gauge & water trap filter. 6 Foot Braided Air Hose with 1/8 Fittings. Compressor mounted airbrush holder that holds 2 airbrushes. Airbrush Quick Disconnect Coupler with 3 Plugs: 1/8 bsp female thread connections. 5 Piece Mini Cleaning Brush Set: Ideal for cleaning small airbrush passages. How-To-Airbrush Manual & Guide Booklet by Master Airbrush. San Diego, California South Carolina. The item "Pro 0.2 Fine Detail 3 Airbrush Compressor Set Kt Dual-Action Nail Art Auto Paint" is in sale since Friday, December 13, 2013. This item is in the category "Crafts\Art Supplies\Painting Supplies\Airbrushing Supplies\Systems & Sets". The seller is "tcpglobal" and is located in Duncan, South Carolina. This item can be shipped worldwide.